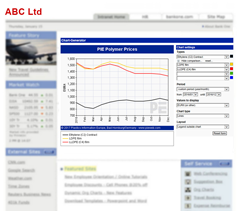 PIE can provide you and your employees with polymer prices, market information and industry news, ensuring easy access to both data and information, 24/7 and on a global scale. We offer competitively priced solutions tailored to your company’s needs. Our "CDI" (Content Delivery & Integration) Intranet Solution gives your employees and colleagues easy and quick access to PIE’s news content via your Intranet, providing them the information they need to handle their daily tasks. CDI is a modular solution, allowing you to integrate only with the bits of information that you really need. To illustrate: You can include a chart detailing the most recent price development in your Intranet. This would allow your purchasing department access to the latest price information. Alternatively you may choose to receive a daily news feed, enabling all your employees to get an overview of the latest industry developments as soon as they log on to their computers. How does the "CDI" Intranet Solution work? 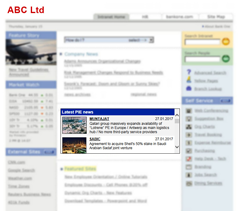 You can place any of PIEWeb’s content on the relevant pages of your company’s Intranet. It only takes a few small-scale adjustments to your Intranet. Once the relevant Intranet page is called up, the PIEWeb content is uploaded directly from the PIEWeb server and displayed at the relevant position. 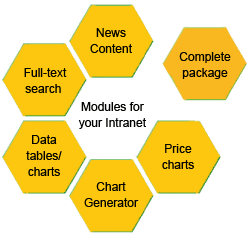 The design of the content selected can be adjusted to meet your requirements. What is the target group of the "CDI" Intranet Solution? Is there an alternative solution for smaller companies? Your company does not have its own Intranet but you would like to have more online users for PIE? In that case, you can simply raise the number of user accounts for your existing subscription. To do so, just visit – www.pieweb.com/order-user-accounts! 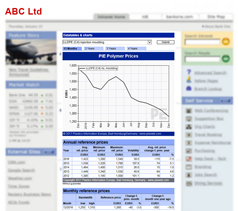 Whatever solution is the right one for you – the content offered by PIE will give your company easy access to the leading plastics industry information source!